Abdominal Exercises for Mature Women. Because, clothes on or clothes off nothing looks better than a nice flat tummy! Worth doing a few crunches for eh! So why do we always give up? 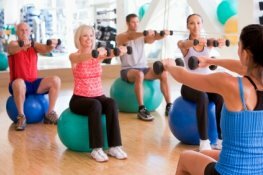 Fitness Ball exercise could change all that for you! I am 62 and consider myself fairly fit but always felt discomfort in my back doing stomach exercises. I have been using a fitness ball now for about a year and find it much more comfortable. When I lie on the fitness ball it supports my back snugly exactly there, where I used to get the discomfort when lying on the floor. This video shows some abdominal exercises that are suitable for older beginners. The trainer Nicole gives us some important information about balance and using the fitness ball. Because it feels so comfortable building up repetitions is no problem. Finding your balance and moving on to a full exercise ball workout to achieve a toned body happens in no time at all. A workout with weights is excellent for speeding up metabolism and helping you to lose weight. You can sit on the ball in front of a mirror when using weights for the upper body and check that you are doing the moves correctly. For other chest and arm exercises the ball can support your neck and shoulders. There are some very good books out now with step by step instructions on fitness ball exercise including some more intensive moves you might like to try as you become more proficient. And you will! Great music motivates and you can watch the exercises first and make sure to use the correct positions. Do something you haven’t done before, it’s what keeps us young. The fitness ball is the best supporting act I know. Some do’s and don’ts to get the most out of your fitness ball exercise. Check out the specifications and buy the best one you can afford. Take care to practice your balance on the ball before you begin. Wear good training shoes to give you a stable non-slide base. When lying on the ball never hold weights above your face. Buy a good quality anti burst ball that will deflate slowly if it’s damaged. Always wear gorgeous work out gear and think slim! Could an exercise DVD turbo charge your workout? It’s always refreshing to get a new slant on a problem. It can inspire you to go the extra mile! Look out for some more fitness ideas and interchange them. Build a fun programme to get fit, fast and be able to wear everything in your wardrobe! Rebounding, Fit, Fast , Fabulous!